Petite earpieces are ideal for those with smaller ear canals. Soft polyurethane foam expands to fit snugly without creating uncomfortable pressure. 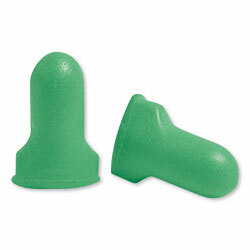 Smooth, soil-resistant closed-cell foam skin helps keep plugs clean. Contoured T shape makes insertion and removal easy. Corded/Cordless: Cordless; Shape: T; Material(s): Polyurethane Foam; Noise Reduction Rate (NRR): 30 dB. Earplugs from Howard Leight! 39 In Stock today.